Ice cream is a crowd pleaser and this one takes on a touch of elegance with presentation. Shown are 3 types of Häagen –Dazs ice cream vanilla, coffee and chocolate. Drizzle the liqueur of your choice over the ice cream. Shown is Bailey’s Irish Cream, Frangelico and Kahlúa. Each liqueur has its own unique flavor that enhances the taste of the ice creams selected. Experiment with the ice creams and liqueurs to see which one is your favorite! Mix it up your way by serving your favorite ice creams and liqueurs. Wrap each pint of ice cream with a napkin. Pour each liqueur into a 3.5 oz. shot glass. Arrange as shown above on a three tier server. 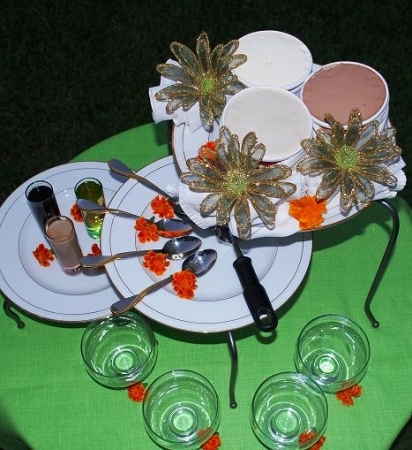 Place dessert cups and spoons around arrangement. Allow guest to scoop the ice cream(s) of their preference and drizzle with the liqueur(s) of their choice. This is a fun, but elegant experience. Scoop, drizzle and enjoy!